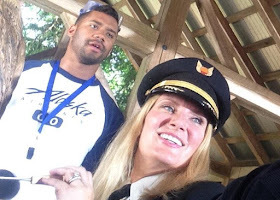 Have you seen the new Russell Wilson commercials for Alaska Airlines? The newest Alaska Airlines commercials feature Seattle quarterback Russell Wilson. 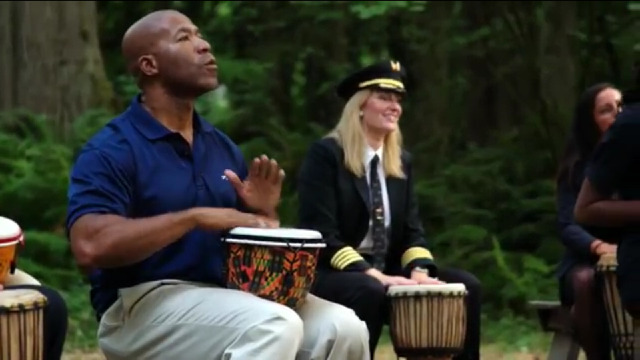 The theme is “Alaska Airlines Company Retreat,” a camp where employees are pushed to greatness by Wilson, who plays a role that’s part counselor, part drill sergeant, part guru. The three commercials feature real Alaska and Horizon employees from around the country, including Captain Erika Jackman. Erika Walker Jackman is a graduate of Shorewood High School Class of 1996 and her mother is Sue Walker, recently retired Superintendent of Shoreline Schools. Erika can be seen in two of the ads, Woodcarving and Drum Circle. Erika is a Captain and Check Airman in the Q400 flown by Horizon Air (owned by the Alaska Air Group). She received her BA in communications from the University of Washington in 2001, while earning her various pilot certifications and licenses. A check airman is a person who is qualified to conduct flight checks in an aircraft, in a flight simulator, or in a flight training device for a particular type aircraft.